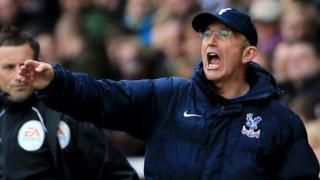 Crystal Palace manager Tony Pulis says that this season has been "a great ride" after they finished it with a 2-2 draw at Fulham. Dwight Gayle scored twice for the visitors, taking his season's tally to seven, but they were pegged back with goals from Cauley Woodrow and a late stunner from Chris David. Pulis says he had to treat striker Gayle very carefully in his fist few months in charge, and took him out of the team to help him following his expensive move from Peterborough, but is confident he can now go on to be a "really, really good player" for the club.